Espiritu Santo more so than any other island in Vanuatu, is poised for greatness. In so many ways Espiritu Santo should have been the main hub and capital city of Vanuatu. Espiritu Santo is a romantic and idyllic destination. No five star resorts or large high rise buildings but instead kilometres of beautiful reef and sandy beach to explore, often without another soul in sight. Wreck diving, fishing, bush walks and blue holes, friendly people and a relaxed pace of life – Espiritu Santo has it all. Subdivisions and land development are relatively new phenomena in Espiritu Santo with the first bare land subdivisions taking place no more than a decade ago. The first regular tourists to the island were undoubtedly the yachties attracted by the same safe anchorage in Luganville that attracted the US Marines in the 1940's. Even today Espiritu Santo remains a popular spot on a sailor's itinerary of the South Pacific, attracted by the privacy, beauty and the many unpopulated and beautiful islands in the vicinity that can be explored by boat. Fast forward to 2013 and what we have is a growing range of bare land and improved land on offer, all of which is still substantially undervalued by global standards and still represents exceptional value when compared to similar property in Port Vila. Furthermore the quality of ocean frontage is superior in many cases to what can be found on Efate. Popular areas for investment include the east coast, as well as Aore Island (formally a playground for the US troops during the war), which is located only a stone's throw from Luganville town. For beachfront lots the typical size is 4000m2 (1 acre) with frontages between 30-40m in width. Many investors are now building permanent or occasional waterfront homes and the building and construction industry has been gearing up to meet the demand. In line with this a new bitumen road was completed in 2010 enabling ease of access up the east Coast to the stunning Champagne Beach, Lonnoch Beach and Port Olry with stops at other features along the way. The last four years has seen a doubling in the rooms available plus a gentle influx of people having a seachange and making Espiritu Santo their new home. The outlook for real estate in Espiritu Santo is very positive by all accounts and commentaries. While the rest of the world learns free market, capitalism sometimes comes with a price more and more people are looking to the fertile and beautiful lands of Santo for solitude, adventure, security and nature’s bounty. There can't be many better places in the world to relax and play than Espiritu Santo. You don't need to buy a slice of paradise on your visit to this place, but at the very least add it to your itinerary – you won't be disappointed! Espiritu Santo is served by multiple daily flight's from Port Vila and weekly international flights from Brisbane. Santo has Vanuatu's highest mountains; Mt Tabwemasana, over 1700 m.
The southern and eastern parts of the island are quite flat, covered with plantations and fine grounds for cattle grazing. 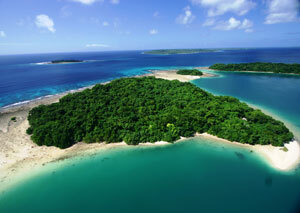 Espiritu Santo was the first island in Vanuatu to be discovered by Europeans in the 17th century. Espiritu Santo was also famous as a military base during World War II, where up to 100 000 soldiers were based. The 30,000 tonne liner "President Coolidge" sank in Espiritu Santo's Harbour in WWII making the world's largest accessible wreck dive. One of the world's recognised “most beautiful” beaches is located on the East Coast. Champagne Beach is awe-inspiring and deserted. This location gives anything in Thailand or Asia a run for its money. 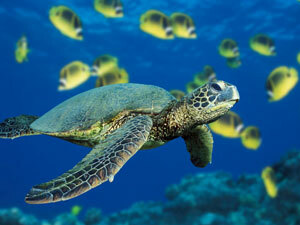 Divers are drawn to Espiritu Santo by its famous wrecks and spectacular marine life. Espiritu Santo is renowned for its particular political history with cargo cults, resistance movements, and rebellions at the time of Independence. Due to its size and its mountains, Espiritu Santo has the greatest expanses of original rainforest home to interesting birds and beautiful orchids. Huge Kauri trees still grow in the southwest mountain forests. Bomber Airstrips: A total of four airstrips built during WW11 and remains of wrecks can still be seen lying around. Cascades Waterfall: A day trip to Big Bay with tropical surroundings to see the Cascades (contact Glen Russell). Nature Walk: Birdwatchers, nature lovers and visitors interested in cross-cultural encounters will have it all on this tour. Millennium Cave: An awesome bush, cave and river canyonning adventure. Infrastructure: The island has fairly good roads that offer access to beautiful white sandy beaches, blue lagoons with Coral Reef Gardens and, of course, the wreck of the 'SS President Coolidge' and nearby 'Million Dollar Point'. Sports: Santo golf club, petanque, watersports, windsurfing, sailing, canoeing, kayaking, netball, rugby, and soccer. Diving: The three dive shops located in Luganville can cater to all your diving needs. 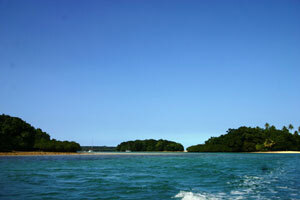 Many small private islands lie just offshore from Espiritu Santo in Vanuatu. 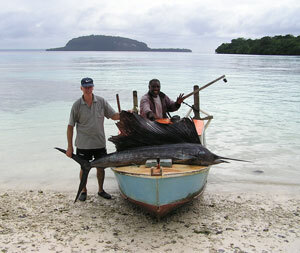 Game fishing is a major recreational activity for visitors and locals alike in Espiritu Santo, Vanuatu. First National Real Estate Espiritu Santo was proud to sponsor one of the local soccer teams. The pristine waters surrounding Espiritu Santo is home to an abundant range of marine life, including the hawksbill turtle. Blue skies and warm waters in Espiritu Santo, Vanuatu. 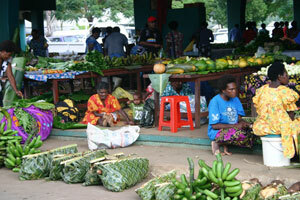 Organic produce is available every day from one of the markets in Espiritu Santo, Vanuatu. 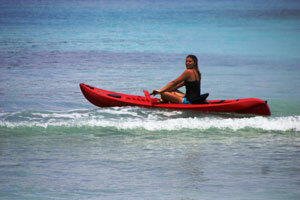 The warm tropical waters of Espiritu Santo provide an ideal playground.